The relationship betweem Sardar Vallabhbhai Patel and Mahatma Gandhi has often been portrayed as a complex one. Through a balanced and historically relevant perspective, this collection of some of their significant correspondences, not only brings out the mutual respect each had for the other but also the differences between the two on various matters of policies and strategies. In doing so, the volume throws light on some of the most momentous periods in the history of Indian freedom struggle. Neerja Singh teaches History at Satyawati College (Evening), University of Delhi. She did her PhD. on “The Right and the Right Wing Politics in Congress: 1934-1949”, from the Centre for Historical Studies, Jawaharlal Nehru University, New Delhi. She has also been studying and lecturing on Patel, particularly on his relationship with other national leaders. The volume intends to make available to the reader an insight into the deep emotional and complex relationship between Gandhiji and Sardar Patel as it comes out through their correspondences. Care has been taken in the presentation and analysis of the documents that it does not become a heavy reading with notes and references. The attempt is also significant as it brings history closer to the readers rendering it free from the domain of archives and libraries. The writings help in dispelling many misconcepts about leaders, events and movements in the ‘popular’ minds. I am thankful to Prof. Bipan Chandra for encouraging me to take up this assignment. Without his help and guidance the volume would not have been possible the way it is. My thanks are also due to Sardar Patel Memorial Society, Ahmedabad; Nehru Memorial Museum and Library, New Delhi; and National Archives, New Delhi. The study of the Indian National Movement has by and large remained the central focus of modem Indian historical writings. The role and contributions of leaders and their successes and failures have been analysed from a variety of perspectives. One very significant aspect of study has been the delineation of differences among various leaders regarding their understanding of the policy, strategy and programme of the anti-imperialism movement. However, there is a discernible tendency among historians to either overplay the elements of unanimity among the leaders or to exaggerate their differences. 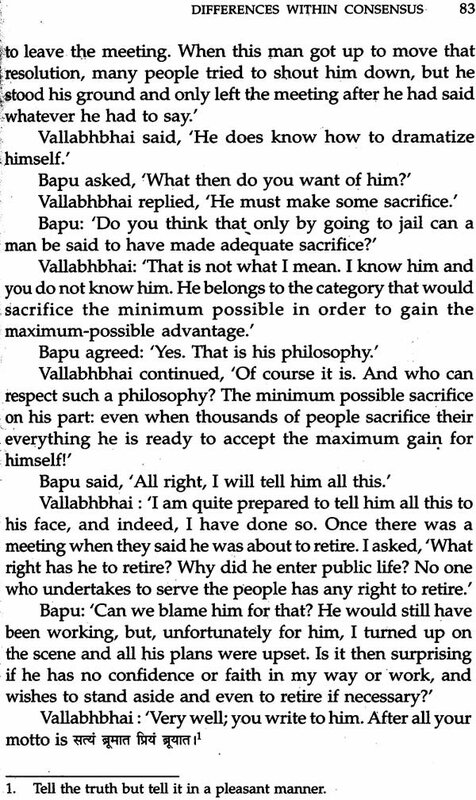 This is especially true in the case of the relationship between Gandhiji and Patel. At the level of popular perception Patel is viewed as a true and devoted disciple of Gandhiji to the extent of being his blind follower; it was Gandhiji’s subsequent fascination for Nehru that gave rise to the feeling among many that irreconcilable major differences existed between the two. But, in fact, neither of the two views is historically valid; they tend to paint Patel pejoratively and misrepresent Gandhiji. Nehru-Gandhiji relationship has sometimes been examined in relation to the Patel-Gandhiji relationship. However, often conclusions drawn have been based on views voiced by the associates of these leaders. Thus the intra-party factionalism has been ascribed to the existence of irreconcilable differences between Gandhiji and Patel. In reality, in an open-ended organization like the Congress differences of views were bound to exist. Gandhiji and Patel shared deep emotional ties based on a deep sense of loyalty and sacrifice which went beyond the nitty-gritty of politics, power and office. True, differences arose between the two over various strategic issues like launching of Bardoli-like Satyagraha instead of Salt Satyagraha in 1930, question of Nehru’s presidentship of the Congress in 1936, withdrawal of Civil-Disobedience movement in early 1930s, implementation of Government of India Act of 1935 and Council-entry in 1935-1938, going on fast as a strategy of political protest by Gandhiji, relationship with Muslim League and Jinnah and response to the Cabinet-Mission and partition. Yet, between the two there existed a basic unity of values and norms on which direction of the national movement and structure of institutions necessary for nation- building were to be decided. 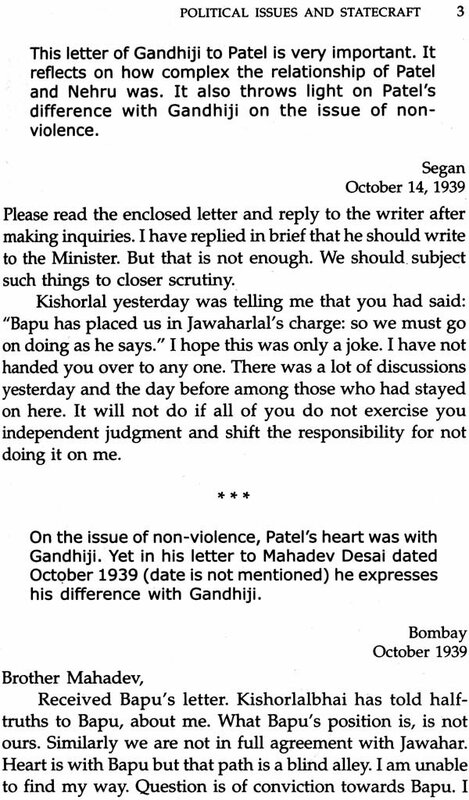 The basic loyalty and the bond of personal affection between Patel and Gandhiji continued unimpaired to the last. Patel’s speech at Banaras Hindu University on November 25th, 1948 after the death of Gandhiji, aptly sums up the emotional and complex relationship he shared with Gandhiji. I claim to be nothing more than an obedient solider of him like the millions who obeyed his call. There was a time when everyone used to call me his blind follower, but both he and I knew that I followed him because our convictions tallied. I am not one given to debates and verbal disputes. I hate prolonged discussions. For several years, Gandhiji and I were in perfect agreement. Mostly, we agreed instinctively; but when the time for a big decision of the questions of India’s Independence came we differed. I felt that we had to take independence there and then. We had, therefore, to agree to Partition. I came to this conclusion after a great deal of heart-searching and with a great deal of sorrow. But I felt that if we did not accept Partition, India would be split into many bits and completely ruined. My experience of office of one year (in the Interim Government) had convinced me that the way we wee proceeding we were heading for disaster. Gandhiji felt that he could not agree with this conclusion. But he told me that if any heart bore testimony to the rightness, of my convictions, I could go ahead. Our leader whom b\he nominated as his heir and successor (Nehru) was with me. 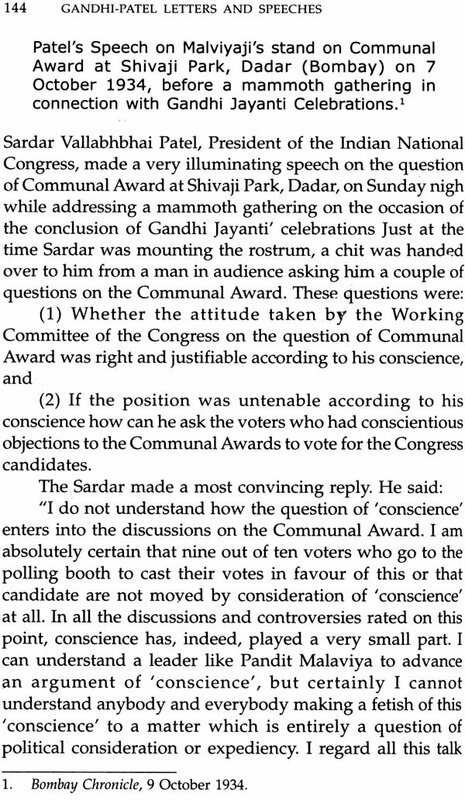 Gandhiji did not oppose us nor did he consent to what we thought was right and proper. Even today I do not repent for having come to that decision, though it was with a great wrench of the heart that we did so. 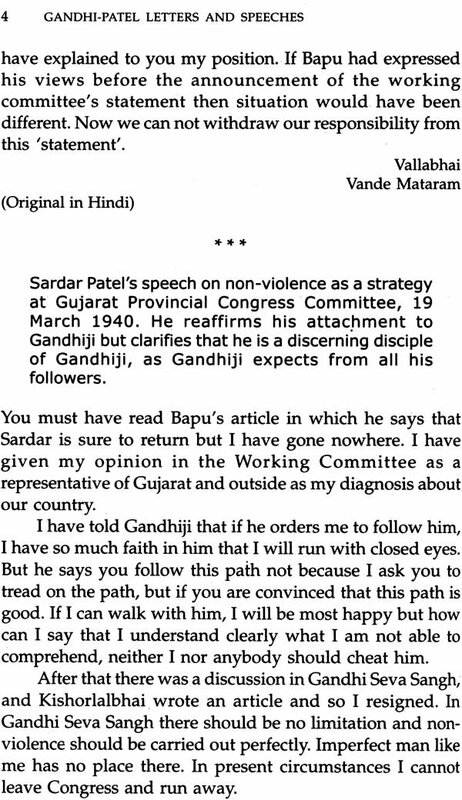 Patel represented Gandhiji’s realism in politics. For example, there were differences of opinion over role of non- violence and giving of support to Britain in its war-efforts in 1939. There was also difference of opinion on how security of the state was to be organized vis-a-vis the normative principles of non-violence, once India achieved independence. Gandhiji was ambiguous regarding how the Indian state was to be organized: what institutions were to be build and on what normative principles? 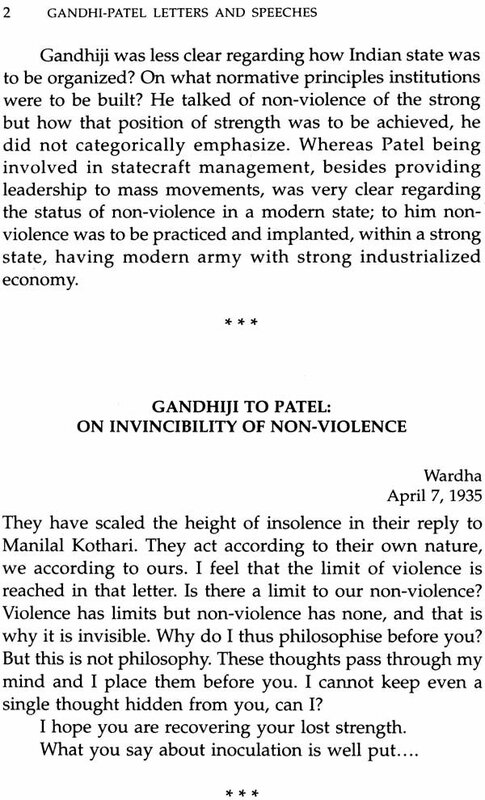 Non-violence, being an ideal, how could it be incorporated in statecraft? Gandhiji talked of non-violence of the strong but the question remained as to how that position of strength was to be achieved. This he did not categorically elaborate. Whereas Patel, being involved in statecraft was very clear as to what should be the status of non-violence in strategic planning for the security of the nation. 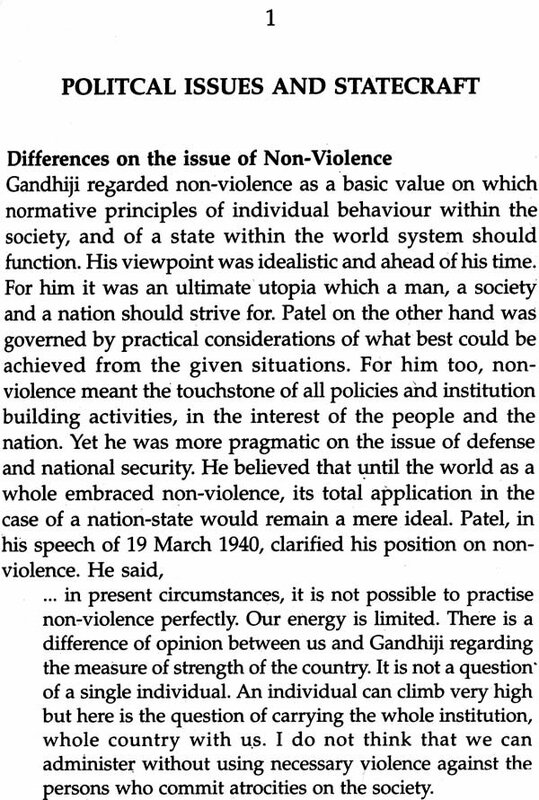 Non-violence without a strong center and economy was for Patel meaningless; it was not meant for the weak. However, Gandhiji’s views on the practice of non-violence in state management, particularly in defence and security matters, was far too idealistic and ahead of his time. 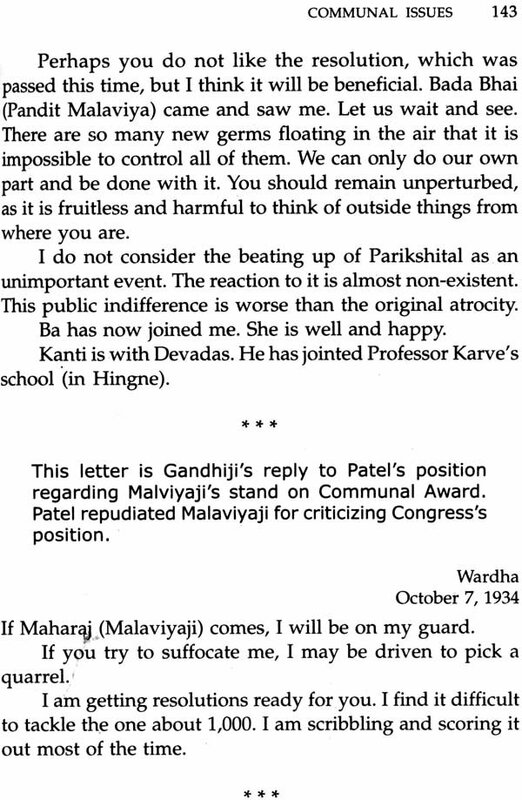 This was the reason why Patel differed from Gandhiji-not, on policy itself but with regard to strategy and practices. Patel believed that his difference with Gandhiji in this respect was in consonance with the emphasis that Gandhiji laid on freedom of conscience of each individual in making a choice in this regard. Moreover, in the process of political debate certain stereotypes about Patel’s persona have developed which often cloud his real self and intentions. The title ‘Sardar’ accorded to him was a manifestation of the status Patel came to occupy within the Congress i.e. that of being a ‘stern- realist’, a forceful and efficient organizer of mass movements and a great disciplinarian. But these aspects unjustly placed an opaque veil over the softer and humane side of Patel i.e., as a caring colleague, a loyal friend, and a paternal and sensitive leader, who understood the needs of his workers before hand and saw to it that mundane issues did not plague the party workers as far as possible. His reputation as the tough man of the Congress was both feared and envied by many leaders of the Congress because Patel was forthright and blunt; for instance, Gandhiji told Mahadev Desai during his days in Yervada jail in 1933 that, anything blunt would appeal to Patel. Patel confronted issues directly and frankly without raising any false hopes or making lofty promises. People knew that when Patel made a statement he meant each and every word of it and that he never indulged in bluff; consequently they trusted him. For example, in 1947 Princes trusted him even if they disagreed with him. Only Patel could have achieved consolidation of the nation. In many ways, Patel represented Gandhian realism in politics, combining it with his commitment to the values of ‘renunciation’ and eschewing personal gains. Patel’s reputation as a tough disciplinarian was misunderstood by many as manipulative, trying to retain his hold over the Congress organization. For Instance, in the Nariman and Khare episode, his toughness was seen as an effort to maintain his hold over Gujarat and Central India. According to Ramakrishna Bajaj, on the contrary, “Sardar’s ruthless ness was an impersonal things. It was in the national interest. Patel wore the mantle of the disciplinarian of the Congress not by choice; he was forced by the political circumstances to do so. 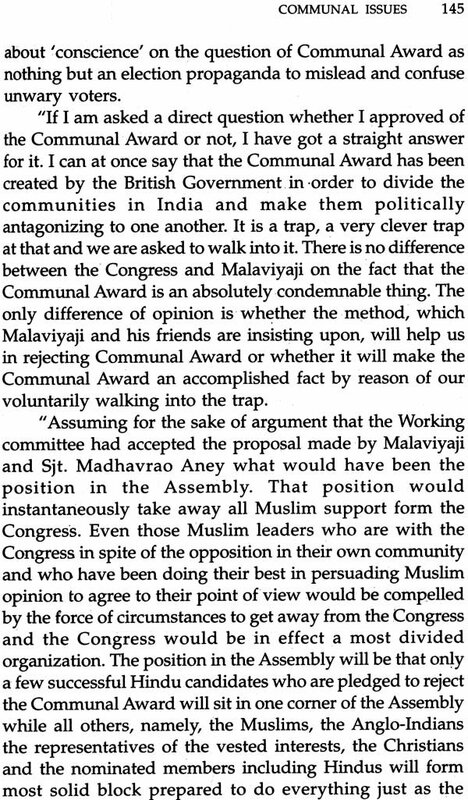 During the crucial period of 1934 to 1947, Congress was seething with difference, dissensions and divisiveness. Patel inherited the ability to establish bridges in relationships through reconciliation of difference, probably due to his upbringing in a joint-Patidar family. This imbued him with values of loyalty and willingness to sacrifice which were expressed in his attitude towards Gandhiji. In Gandhiji’s personality he saw the reflection of the values through which the talented and deserving sibling was to be protected, promoted and encouraged as in a joint family. In consonance with this Patel made sacrifices for Vithalbhai and he made sacrifices for Gandhiji in 1928, 1936 and 1946. Poor health of Rajaji in 1936, mild disposition and indecisiveness of Rajendra Prasad, and his involvement in taking the question of anti-imperialist struggle to the international platform, socialist Nehru’s pre-occupation with mass propaganda, left him little time to devote to party organization, swings of mood of Maulana Azad and the socialists and communists engagement with the politics of capturing Congress organization, put Patel in a predicament where he had to ‘adorn’ the mantle of a tough disciplinarian so that anti-imperialist movement could not go off roads. For him, protecting the process by which Swarajya was to be achieved was an ultimate goal. This was Gandhiji’s dream, too. Devdas complained against your speech today. 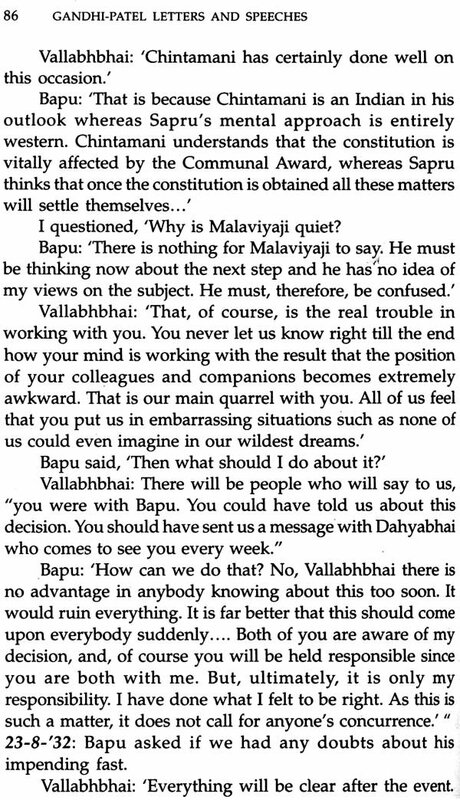 Then Jayaprakash came and spoke about it in great distress. I think your speech was unduly severe. You cannot win over the socialists like that. If you think it was a mistake, get special permission for Sub has to go to the rostrum and speak so as to wipe their tears and to make them smile. We should never return blow for blow. Forgiveness is the ornament of the strong. They will not hurt others by their speech. I am given to understand that both you and Jayaprakah harbour some bitter feelings against me personally. I assure you, I am not conscious of having given any cause to either of you for entertaining any such feelings. No doubt, politically we differ strongly, but you are the last man to resent such difference. It is just possible that having no personal contact you may have been misinformed as you have been about the Lahore Presidential election contest and you have formed you opinion about me on unfounded reports which you may have believed to be true. I shall be thankful to you if you will point out o me any instance in which I have given you any cause for such personal dislike or prejudice. Jawaharlal is bearing even a greater burden than mine and . he is storing his grief within him. May be, due to my old age, I may not have remained of much use to him. That incapacitates me from lightening his burden even though by remaining at his side. Maulana too is unsatisfied with me and you have to defend me now and, then. This is an intolerable position for me! Under such circumstances, if you would relieve me from my responsibility, it may proved of help both to the country and myself. I cannot carry on in a manner different from what I am carrying on today. If I prove to be a burden to a life long colleague and be a source of anxiety to you and yet I allow myself to continue in office, I would only think of myself that I am there only for the lust of power in me. Please extricate me from such a loathsome situation. The letters are a testimony to the fact that factional politics within the Congress appeared to exaggerate differences existing between the leaders. The loyal ties between the leaders were so strong that despite verbal expression of differences Patel never left the side of either Gandhiji in whom he had intuitive faith or of Nehru, with whom he had an affectionate but ambivalent relationship. The documents included in this collection deal with differences and similarities in the views of Patel and Gandhiji on various political, strategic and social matters. 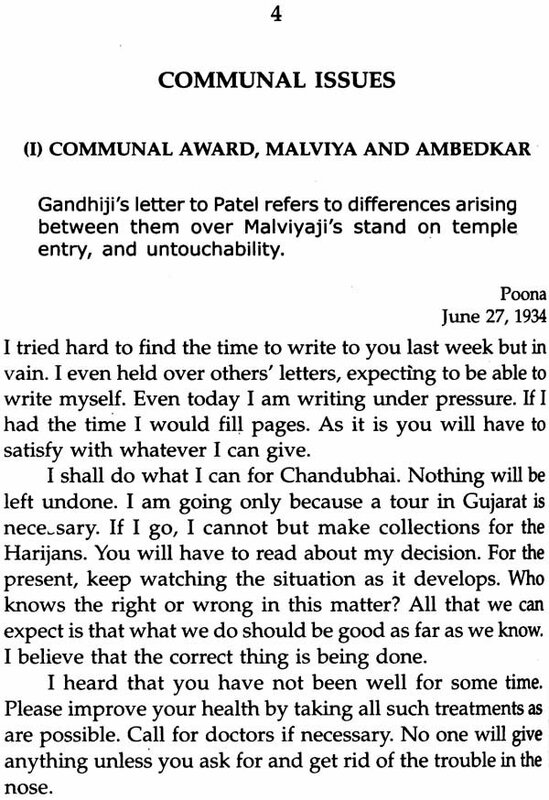 The letters appear to express different viewpoints of both Patel and Gandhiji but they also reflect how these differences did not reach a breaking point between the two. 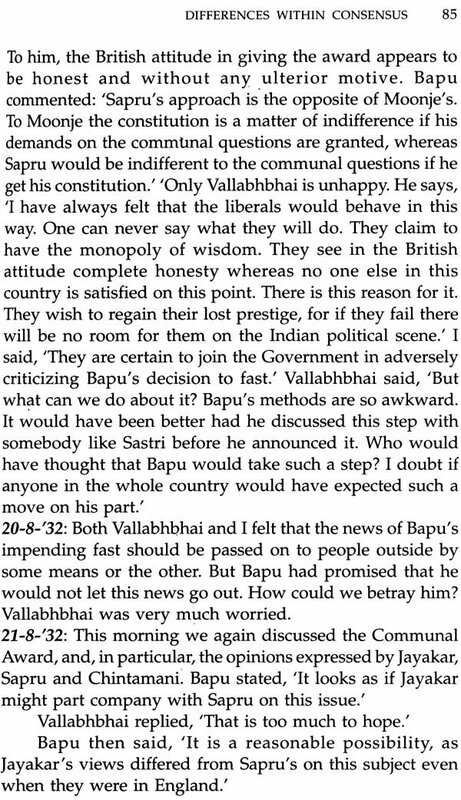 Although references to Patel’s deviation from Gandhian path have been made by Gandhiji but in no letter does the difference seem to reach the point of breakdown, except perhaps in the letters written in 1947, 1948 over the issue of governance and the building of basic institutions for the country. The documents included in this Collection covering the period 1929 to 1947 are drawn from Sardar Patel Papers, Ahemedabad; Rajaji Papers, Nehru Memorial Museum Library, New Delhi; Rajendra Prasad Papers, Nandurkar (ed.) Sardar Patel’s letters-Mostly unknown, Ahamedabad; Collected Works of Gandhi, (Relevant Volumes): Gandhi’s Letters to Sardar. 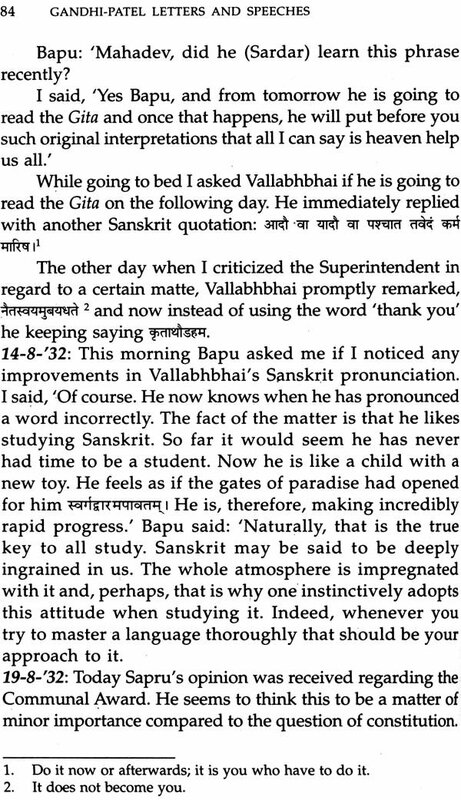 (Translated from original in Gujarati and edited by Valji Govindji Desai and Sudarshan V. Desai, Ahmedabad 1957; Nandurkar (ed.). Sardar Shree ke Vishnishta Aur Anokha Patra-II (in Hindi), 1918-1948, Ahmedabad 1981. Many of these letters are not easily accessible to the reader. The collection is divided into five sections. Section I deals with the correspondence on Political and Strategic Issues; Section II is on the Differences Within Consensus; Section III is on the Internal Dynamism In Congress; Section IV is on the Communal Issues; and Section V is on the Differences in Style. In the interest of faithfulness to the original text, minor omissions and errors have been retained as they are.